Members of the Faculty of Medicine and Surgery convened in the boardroom at the Medical School last week to host Professor Angelo Psaila for drinks on his retirement from the Department of Medicine. Professor Psaila qualified MD in 1961 and is a Fellow of three Royal Colleges of Physicians in the UK. He spent 35 years teaching medical students and for many years was head of the Department of Medicine at the University of Malta and Director of Medicine at St Luke's Hospital. Professor Godfrey LaFerla, Dean of the Faculty, outlined Professor Psaila's professional career and praised his strong commitment both to medical practice as well as to teaching. 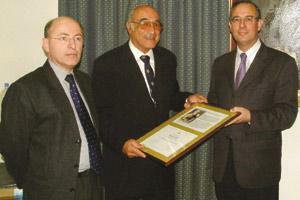 He also mentioned his role as a sportsman and as founder of the Malta Medical Tennis Association. Professor Joseph Cacciottolo, head of the Department of Medicine, in his address, recalled Professor Psaila as a sincere person with a strong personality, and one who was always true to the ideals that he believed in. Professor Cacciottolo presented Professor Psaila with a memento and token in appreciation for a lifetime dedicated to teaching.